Find you new home in Pine View Estates, an active adult community in Howell NJ. Pine View Estates is an Active Adult, Over 55 community. 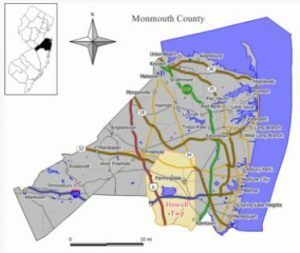 Due to it’s location in the Ramtown section of Howell, shopping, dining are easy to get to and The Jersey Shore is nearby. Construction in the community was started in 2006, and there are 177 homes in Pine View Estates. The monthly association fee includes lawn maintenance, snow removal and use of the clubhouse, pool and common area. The homes in Pine View Estates are single family, with either 2 or 3 bedrooms, 9′ ceilings and a 2 car garage. Five different floor plans were offered with either two or three bedrooms The homes have up to 1863 sq ft. and all have a two car garage. The clubhouse is the social hub of Pine View Estates, and it features an outdoor pool. There are also tennis courts. The beautiful clubhouse has an exercise room and, in addition, they plan many activities throughout the year. Additionally, there are many public golf courses in the Monmouth County Park System. At Pine View Estates, amenities are centered around the charming clubhouse, which The clubhouse provides plenty of gathering spaces and activities. Residents can join in a game of cards, stay connected on the computers, or attend a party in the multi-purpose room. The clubhouse also contains a fitness center for those who desire to exercise and stay in shape. Pine View Estates’ thoughtful amenities continue outside. When the weather is warm, residents can enjoy the swimming pool. The picnic pavilion is a great place to relax while meeting with friends and family. In all Adult Communities in Monmouth County there is a bus service which takes people from each community to local shopping centers, supermarkets and malls. The county also provides a medical transport bus which takes people to any medical facility or doctor’s office in Monmouth County. However, there is a minimal charge for this service and these trips must be scheduled in advance. People love living in Pine View Estates because this active adult community offers easy access to major transportation routes and the Jersey Shore. To see the active adult community homes for sale in Pine View Estates, Howell NJ, call Bunny and Art Reiman, the Active Adult Community Specialists at 732-616-6226. We were getting on in years. The big house was to much work to maintain any more and we decided it was time to move to an adult community. We spoke with Bunny, and we selected a few homes to see. These homes were not what we wanted, but in speaking with Bunny and Art, they quickly zeroed in on what we wanted. On the second trip, we found the community we wanted to live in. After the house in Staten Island was sold, we looked at 4 homes they selected, and one was perfect for us. They recommended an attorney, a house inspector and even a good painter, and held our hands through the entire process. We heartily recommend them because they know every adult community in the area.